Study Geelong Student Ambassadors help strengthen relationships between international students and the broader Geelong community and promote Geelong as a friendly place to learn, live and explore, through storytelling on social media. Round 2 is now open and closes at 5pm on 13 March 2019. Please note that you must apply for a Working with Children Check card (volunteer classification). You do not need to have received your card prior to submitting your application to become an ambassador, simply have applied for your card. Read on for more information including how to apply here. Congratulations to the 2019 Study Geelong Round 1 Ambassadors. We had a hard decision, so well done to the following students: Joan (Kenya), Chirag (India), Sharavati (India), Aayushree (Nepal), Christian (Australia) and Nandish (India). Aki (Japan), Chirag (India), Cindy (China), Sanjay (India), Stephen (Vietnam), Tayyaba (Pakistan), Zohaib (Pakistan) and Alvia (Pakistan) & Tash (Australia) - not pictured. 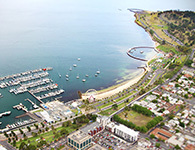 Congratulations and we look forward to working with you to show what an amazing place Geelong is to Learn, Live & Explore. Thank you to our 2017 Ambassadors: Gabriel Chuwang-Kwa, Hung Wei Liu, Shu Al Barhi, Balaji Trichy Narayaswamy, Ron Bunker, Jacinta Smith and Mohammed Al Farsi (absent in photo).